The Dell Computer Company is one of the great success stories of the 20th century. Started in 1984 by then-college student Michael Dell, it rose to become one of the computer giants well into the 21st century. To understand what makes Dell so great, you need to understand the power of Dell's mission statement, as well as its history, growth, and entrepreneurial founder Michael Dell. Michael Dell was a student at the University of Texas at Austin when he invented Dell in his off-campus dormitory room. His aim was to sell IBM PC-compatible computers built from stock components. Michael started trading in the belief that by selling personal computer systems directly to customers, PC's Limited (the original name of the company) could better understand customers' needs and provide the most effective computing solutions to meet those needs. Michael dropped out of school in order to focus full-time on his fledgling business after getting $1,000 in expansion capital from his family. A Brief History of Dell Inc.
Four years after its founding, shares of Dell stock were sold for $8.50, and the computer companies IPO raised $30 million. Dell has employed as many as 78,000 people worldwide, which is five times as many people as there are employed at the University of Texas, the birthplace of the company. Dell products are now also sold online and at Wal-Mart, Staples, and other retail outlets. 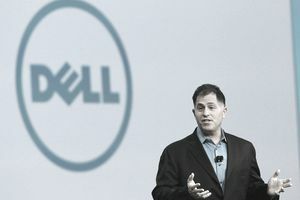 Less than a decade after Michael Dell sold personal computers from his dorm room, he became the youngest CEO to head a Fortune 500 company, when Dell was first included on the list in 1992. In 2014, Dell was removed from the Fortune 500 list completely when the company was taken private and stopped making official earnings figures available to the public, or to the Fortune 500 list-makers. In 2004, Michael left his position as CEO of Dell and devoted his time to the Michael & Susan Dell Foundation. He later returned as CEO of Dell in 2007. The Dell family home in Austin, TX, is reported to be the 15th largest home in the world, with eight bedrooms, 21 bathrooms, a conference room, a gym, and a total of 22,000 square feet nestled on 60 acres. As a pioneer in e-commerce, Dell.com set the bar high when it sold $1 million per day of equipment seven months after its online launch in 1996. In 2007, Dell.com became the fourth largest U.S. e-commerce site, with $4.2 billion in sales. In 2016, Dell claims it was the "largest e-commerce website for commercial technology products in the world." In 2017, Dell came in third in worldwide market share, shipping $40.7 million worth of product for the calendar year 2016. In the 2010s, Dell began focusing on e-commerce and social media strategies in order to reach loyalty and potential customers with various marketing strategies. The marketing effort worked. One mobile phone campaign that advertised sweepstakes received a better response rate in four hours than a comparable direct mail campaign had received in 30 days. Dell also has reportedly earned over $1 million in revenue by transmitting messages about sales and discounts to its Twitter followers. Well, we started the company by building to the customer's order...We didn't do it because we saw some massive paradigm in the future. Basically, we just didn't have any capital. It's customers that made Dell great in the first place...If we're smart enough and quick enough to listen to customer needs, we'll succeed. Dell's global headquarters campus is a 2.1-million-square-foot facility powered completely by wind power and gas energy converted from a landfill. On-site employees have access to a fitness center, banking centers, employee store, a mother's room, and notary public. A total of 39,500 people are employed in the Americas region, with manufacturing facilities in Austin, TX; Nashville, TN; Winston-Salem, NC; and Eldorado do Sul, Brazil. There are 32,100 employees in the Asia-Pacific region. Manufacturing facilities are in Malaysia, India, and China. Regional offices are in 13 countries.